When a child’s birthday comes, each parent has a list of things they need to do first – inviting guests, booking a venue and buying a present. Preparing or buying a cake is an important task that most of us leave for the end. The birthday cake is a central attraction of every kid’s birthday party. That’s the reason why deciding on a cake can be quite a challenge. Also, we have too much choice when it comes to ingredients and the decoration. However, some cakes will never stop being popular and cease to amaze us – they are unique, colorful and visually stunning and the part of their popularity comes from the fact that they don’t require superb culinary skills. Here are the top 5 homemade birthday cakes that you can easily make on your own. Try them out and thrill your little birthday boy or girl! Animal themed cakes are without a doubt the most popular ones among kids. Cats, puppies, bears, bunnies, squirrels and hedgehogs are just some of the possible designs. However, teddy bear-shaped cake is by far the cutest. It’s also one of the cakes which has the most variations when it comes to ingredients, size and shape. We recommend Teddy bear cake with delicious and soft chocolate frosting. Decorate your sweet teddy with a heart and don’t forget to emphasize its chubby belly (use different frosting). The only drawback is that you’ll be sorry to eat such lovely cake! Cakes adorned with candy are far from healthy, but kids love them so much. They’re always decorative, colorful and popular at kids’ birthday parties. 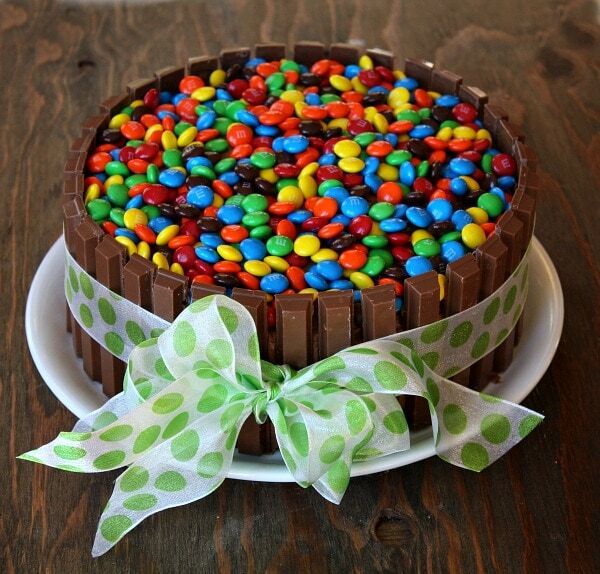 Here’s one interesting idea: you could “surround” your cake with Kit Kat (it should resemble a wall) and pour some M&M’s over it. Or, if you’re not fond of M&M’s, you can use chocolate malt balls instead. The actual cake can be whatever you wish. We recommend something buttery and with vanilla frosting. You could use these ingredients for the base: 1 cup butter, 2 cups sugar, 1 cup milk, 4 eggs, vanilla extract and 3 cups flour. You don’t need to decorate your cake with candy to make it burst with colors! A rainbow cake is one of those desserts that are visually stunning, but not hard to prepare. This cake is one the most popular ones with both kids and grownups. Its beautiful layers, so called sponges, can be made with any color you need and you can experiment with pan size, icing and the number of layers. The greatest thing about this cake is that it’s colorful on the inside as well and suits most birthday party themes – with the rainbow cake, you just can’t miss! Princess castle cakes are not something most mums decide for (on condition that they are making the cake). This cake has a “bad reputation” as most people think it’s complicated to make and the decorating can take a lot of time. This doesn’t necessarily have to be true – there are recipes which are simple and easy, and suitable even for the beginners. This is one of those desserts that are sometimes “too beautiful to eat” and your little princess will surely be grateful for such a wonderful surprise! Here’s an interesting idea if your kid’s guests are mostly boys (or girls who love sports) – a football-themed cake. Black and white fondant icing is the most important feature of this cake and if you want to take it up a notch – make a piñata with little balls coming from the cake’s interior when you cut it. The only shortcoming is that it requires lots of ingredients and 3-4 hours of your time, but when you see the expression on your child’s face – it will be worth it!